The famous firearms and ammunition designer, John Moses Browning, is quite well known for designing numerous military small arms systems, heavy duty weapons, and various cartridges for the firearms he designed. One of his most popular caliber designs overall, and his top pistol caliber design is the .45 ACP or Automatic Colt Pistol round is highly regarded among pistol shooters as a highly effective combat handgun cartridge. Many handguns and sub-machine guns have been chambered in this famous pistol cartridge since John Browning designed it in 1905. In addition to the .45 ACP, there are quite a few variations on the market right now. These include many different +P variants, the 45 Super, 45 GAP (Glock Auto Pistol), and the 45 Auto Rim of course. The .45 ACP has also been loaded with multiple bullet types, various weights, and its popularity is seen by its use in many current firearms. 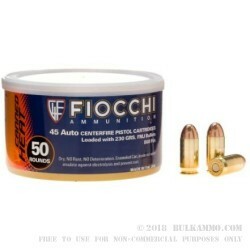 This Fiocchi 230 grain FMJ or Full Metal Jacket Canned Heat ammunition cartridges are enclosed in a heavy copper jacket and feature a one-piece lead core within. These bullets are loaded into new, heavy wall, reloadable, high polished, non-corrosive Boxer primed, classic yellow brass cases. These have a subsonic muzzle velocity of 860-feet per second, and they have an impressive muzzle energy of 377-foot pounds. These are ready to go to the range with you in Fiocchi's popular Canned Heat packaging, with 50 rounds in each can. At the reasonable prices we offer, you can afford to stock up multiple cans of this hard-hitting ammo and go out for a day of shooting the famous 1911 pistol or Thompson sub-machine gun. Stock your safe full of Canned Heat 45ACP today. Q: Are these rounds stored loose in the can or are they held in place somehow? 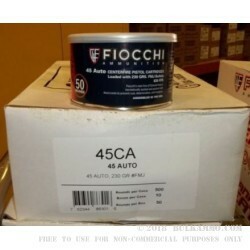 A: This Fiocchi Canned Heat ammo is stored loose in the can. This makes it easy to grab a handful and load them into magazines quickly.